Coconut... it's everywhere these days, isn't it? We've all seen the coco-water craze, and personally I'm obsessed with the oil and manna (manna dollop on oatmeal anyone?). But Coconut Balsamic? Ohhh, yes indeed. Last weekend I attended a local food festival, North Eats, in Carlsbad, CA. Showcasing some 25+ local North County San Diego restaurants (Blue Ribbon, Local Tap House, Prep Kitchen and Solterra being a few of my favories). 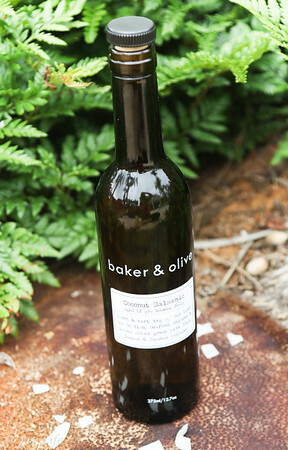 The sponsor, Baker and Olive, challenged the chefs to feature Baker and Olive oils and vinegars in their recipes, and oh my goodness did they succeed. I'm still craving Prep Kitchen's savory Potato Agnolotti, and that Honeydew Melon Gazpacho from Solterra will be a must have whenever I visit. But it was Master's Kitchen's Coconut Lime Shrimp Sapicon (think shrimp, mango, coconut and lime on small toasts) that took me to Baker and Olive for a bottle of Coconut Balsamic to call my own (Note I came home with olive oil from Spain, a Tuscan oil and a Sicilian Lemon White Balsamic in addition). Yes... Coconut Balsamic, a white balsamic infused with the scents and flavors of any tropical island you can think of. Slightly tart with the balsamic notes, the coconut makes a rich, flavorful vinegar that I can only imagine paired with a Lime infused Oil (it's on my to try list). But how perfect does it pair with my strawberry salad? Simply perfectly perfect in my opinion. 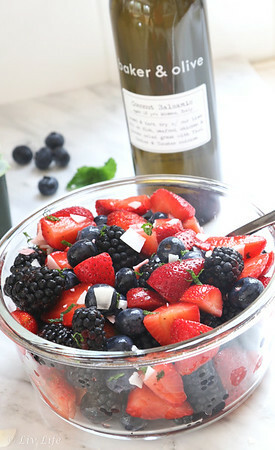 Just in time for your 4th of July celebrations tomorrow, this simple salad receives an extra coconut kick from the coconut balsamic, but a drizzle of any white balsamic will do. Toss in finely sliced mint ribbons and top with crunchy coconut chips and your potluck dish is ready in no time. And... it will be gone in time too. Infused with flavors of the islands, this salad gets an extra coconut kick from my new find - Coconut Infused Balsamic. Don't have any on hand? Simply sub a drizzle of any white balsamic for a lovely sweet/tart sensation. And added Coconut chips make it irresistible! 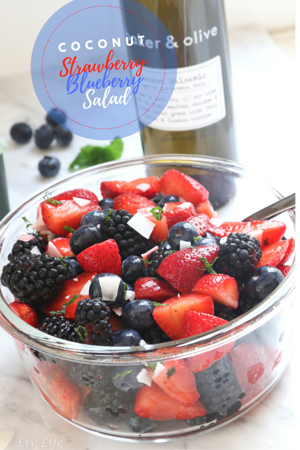 I've simply listed ingredients here without measurements as your salad can be for just you or a huge potluck version - some of my friends love the tart pop of balsamic while others prefer only a small hint of flavor. Start small, and adjust to your taste! 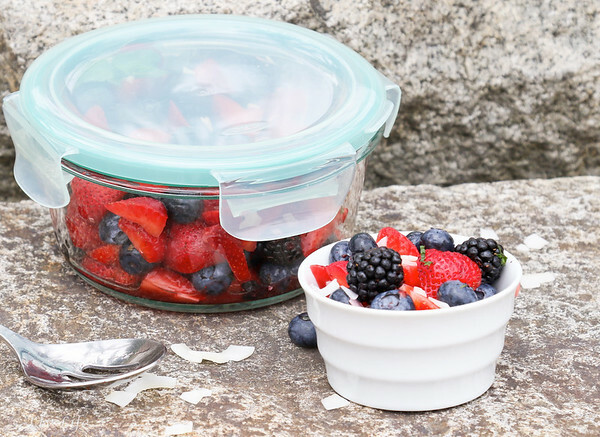 Wash berries and slice the strawberries. Place in a bowl add the sliced mint. Drizzle with 1 Tbs balsamic vinegar, and stir gently. Taste, and adjust with more balsamic if desired. When ready to serve garnish with additional mint and coconut chips. My strawberries were very sweet and didn't need any sweetening, but if yours are not so sweet you may want to add a touch of your favorite sweetener - honey, agave or pure sugar... whichever you like! Liv Life Note: This review of Coconut Balsamic is NOT sponsored by Baker and Olive. I purchased the oils and vinegars myself, and am so happy with the product I simply want to share!